An unified and general approach to the poetic enjambment is here presented. This well known conflicting interrelation between syntax and metrics is here extended to all syntactic levels and all metric levels, each series being organized as trees, which are mapped onto the same spoken or written text. The mapped –linearized– tree becomes an isomorphic family of partitions of the text. 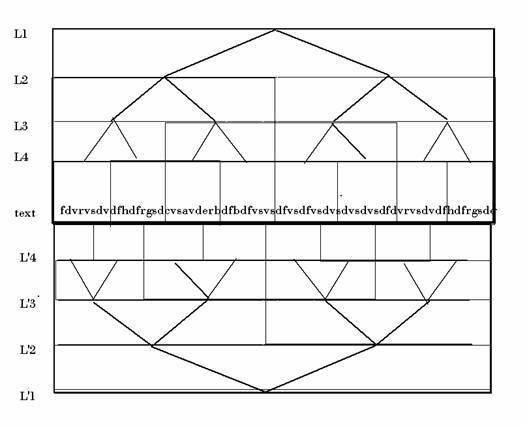 Thus, simultaneous partition families interact between themselves in pairs, as other trees –pragmatic, semantic and rhyming ones– act also simultaneously on the same text. Generalized enjambment occurs when boundaries belonging to different families do not coincide. An enjambment gravity degree is then defined using a canonical relationship between tree pairs. This formal model can be extended to other –linguistic or not– sets of tree structures applied on –linear– strings or other multidimensional topological sets: line and colour in Art, motive and harmony in Music. Poetic enjambment, or extension of a constituent over the end of a verse line, is on one hand, an artistic play that smoothen the poetic rhythm in verse. On the other hand, it introduces difficulties, sometimes important, in its recitation: indeed, the reciter must keep the rhythm given by the metric of the poem or play; but, at the same time, he/she must keep also the attention on the enjambed constituent to assure that its intonation realizes it in fact. This conflict is not different, by the way, of the musical one, where melody and rhythm coexist, sometimes duplicating their roles, coinciding, others contradicting one to another. This problem, the harmonious blending of two directives of diverse nature –artistic and linguistic– must be solved in sound, saying the poem in such a way that the text respect both. A traditional problem has been, at this respect, the pause at the end of the enjambed line. Should it be done or not?. This problem was recently tested with a group of listeners in Sánchez and Bergé (1999). Since syntax is realized mainly through intonation, and metrics through rhythm, let us review the main approaches to both features in speech. Spanish intonation has received wide attention, but the general approach has been mostly descriptive, as can be seen in Alarcos Llorach (1971), Fernandez (1986), Navarro Tomás (1974) and Quilis (1981). The huge complexity of speech intonation seems to have prevented the appearance of simple and systematic models, with the exception of mood prosodemes (asseveration, question and order), which are fairly well typified, perhaps due to their easy perceptibility (see Bergé and Sánchez 1995 for this aspect). Other phenomena, more unconsciously perceived, were overlooked (in the past and even to this day) by scholars who made exclusive usage of their hearing. To this end, measuring devices (when wisely used) have proved to be very useful to detect subtle shades of intonation. We have developed and made extensive use of these tools in this and former studies, as Sánchez (1977, 1979, 1995, 1996) and Bergé and Sánchez (1995). English intonation, on the other hand, has been well described through definitions, models and notation by Bolinger (1972), O'Connor (1973), Crystal (1975), Lyons (1982), Roelof de Pijper (1983) and Halliday (1988). Besides, more formal approaches have been presented, specially for the syntactical domain, in García Calvo (1979, 1983) –for Spanish–; Pierrehumbert (1981), Selkirk (1984), Kaisse (1985) and (mainly for metrics) Liberman (1975) –for English–; Vaissière (1974) –for French. Laver (1994) offers a comparative study in several languages in which similar behaviour can de detected, even for tone-languages. All these studies, proceeding from linguists, phoneticians, acousticians and electronic engineers, show the extreme importance of pitch and intonation to separate, construct and express, in speech. As it is well-known, in this kind of metrics, the syllables belong formally, abstractly, to two classes: long and short (Steingass 1886; Crusius 1950:10-30; Batmanglij 1988). Longs are uttered longer than the shorts in their vicinity –which does not prevent a short in a slow passage being longer than a long in a quick one. Let see some examples of these metrics, now indicating shorts with lower case and longs with capitals. Accents do not coincide necessarily with longs, but do so often. Regularly spaced stresses acting as feet references, where 2,1 or no syllables fill the gaps. It is a very old and also a very modern technique, allowing a free flowing of speech, nearer to prose than other types. Usually, in modern times, with irregular lines (unequal number of feet) as well. 1. A set of trees: each one a partially ordered set. Each generation of new branches will be called a level. 2. A (preferred) linearization of each tree. 3. A reordering of the preferred linearization due to another criterion –for instance, one derived from another tree. 4. A (finite) text on which these (reordered) trees can be applied: the text can be partitioned so that any part of it will have an isomorphic tree branch. 5. A canonical relationship between each pair of trees, defined by pairs of related levels in each tree. 6. An application of this (finite) text on a multidimensional (continuous) function: several functions of the same variable or parameter (called time). 7. An Enjambment (E) between a pair of partitions of the same text pertaining to canonically related levels of different trees is defined as the occurrence of a non coincidence of their boundaries. 8. The Generalized Enjambment (GE) between a pair of partitions of the same text pertaining to any level of two different trees is defined as the occurrence of a non coincidence of their boundaries. 10. The Density of GE in an specific text is the sum of all the GE occurring in it, weighted by their gravities and normalized (divided) by the text length. Let see these points one by one. A text is a string of symbols. This is a totally well ordered finite set -a string, a chain– of elements called characters. The characters are taken from two other finite sets called alphabet –whose elements are called letters– and punctuation –whose elements are called signs. Thus the characters of a text are either letters or signs, ordered in a line or string. Any character is placed either before or after any other –they accept the ordering criterion– .There ist a first –before all– and a last one –after all. Two characters are called contiguous when there is not another placed before both or after both. When they are not contiguous, those elements placed before one and after the other are called intermediate. The string (qa:sdasd.as,sdasd,asdasd) is thus a text, where the first letter, a ’q’, has a contiguous character which is an ‘a’, both taken from an alphabet, the actual English alphabet. .
A family of partitions of a text is an totally ordered set of partitions of it, in which a partition is an ordered set of disjoint subsets (sub-strings) of the text that covers the text (the ordered addition of all these subsets is the text) without overlapping (the intersection of any pair of sub-texts is empty). Within a partition, any letter of the text belongs necessarily to one of the sub-texts, and only to one of them. Additionally the characters contained in any part must present the same total order that the (total) text –they follow one to another in the same way (any partition can be then considered an the result of cutting a newspaper text line with scissors without cutting any character, of course). Fig.1. Two linearized trees applied on the same text. Each branch points to a box that contains a part of text. Each level (L1,L2,L3,L4) determines a partition. Note the Enjambments –non-coincidence of related partition boundaries: L1-L’1, L2-L’2 and the Generalized Enjambments between unrelated levels: L1 with L’2, L’3, L’4, and so on. also represented by some parts of the text, or not be expressed at all. In the three cases we will call links these explicit or inexplicit boundary markers. A traditional example of partitioned text is a paragraph in a book segmented into words and punctuation signs: among the last, the blanks are markers that point to word boundaries. Another partition of the same paragraph is the set of sentences and punctuation markers, which are, is this case, full stops, interrogation and exclamation marks (the last two being also boundaries of other simultaneous tree-partition family, the pragmatic one). Note that while spaces are links between words, thus belonging to the lexical partition, full stops are links between sentences, thus belonging to a different partitions, the sentence partition. In the same way, prepositions are links between SW meanwhile conjunctions are links between clauses. Links do not belong to the units linked by them but do belong to the superior unit made up by the inferior units with their mutual links. A general sentence could be therefore: “If [clause1] then [clause2]” , made by four elements, two links and two lower units (clauses). Since any word belongs to –only one— sentence, the second partition contains the first in the sense that all the elements of any part of the first partition are contained in the same part of the second, and only in one: –all characters of a word belong to one and only one sentence. Note that any letter of the text belongs simultaneously to parts belonging to both partitions. Both partitions belong to an ordered set of partitions, called the syntactic family in our example. These families can seen as a set of Chinese boxes or Russian dolls, where inside each one you find one or several others. These family of boxes can also be represented as a tree, where each box appears as a branch, and se inside boxes as branches emerging from the former. Thus each branch has a related box and only one, and the same happens in the other sense. Tree and box family stand in an isomorphic relationship respect the partial ordering which is determined in the family by the binary relation ‘to be contained’ and in the tree by the branch relation ‘emerge from’. In Fig.1 is represented this isomorphism for two simultaneous tree-families. The tree is defined here as admitting only the following levels: paragraph-clause-high constituent-...-low_constituent-syntagmatic_word (see below). Higher levels could be added however: titled paragraph, section, chapter, book, collection, library.... Lower levels could also be considered: lexical item (lexeme), morpheme. The letter is not a syntactic category. The tree is defined here as admitting the following general levels: poem-strophe-stanza-verse line-hemistich-foot-syllable. Higher levels could be considered however: poem book-complete poetic works., and so on. No lower levels seem possible: the letter is not a metric category Perhaps the mora –melodic fluctuation within a syllable–- could; we do not include it for the moment. We differentiate two similar concepts, strophe and stanza, by assigning a wider scope to the first. In each particular case, several levels can be missing, according to the specific metric form: quantitative –meters made with feet; feet made with long-short syllable patterns–, syllabic-accentual –meters made by lines with counted syllables until the last stress; accentual –feet made by regular stresses; having each a variable number of intermediate syllables; and some combinations and transitions between them. This relationship, established by tradition, pairs levels in each tree or. what is the same, partitions in each family. They can only be considered as regular tendencies or usual association, never a law or prescriptive norm. The are useful, however, as a reference to check divergences from them, so measuring a degree of departure from these tendencies, which are based on the phonetic, lexical and syntactical behavior of each language. Table 2. A text particioned into two family-trees: syntacti (up) and metric (down). Three levels for the first: sentence, constituent and syntagmatic word (and lexemes in the text). Three levels for the second: stanza, verse line, foot (and syllables in the text). Table 3. A text partitioned into two family-trees: syntactic (up) and metric (down). Three levels for the first: sentence, constituent and syntagmatic word (and lexemes in the text). Three levels for the second: (half) stanza, verse line, foot (and syllables in the text). Milton, Lost Paradise, I, L200. In speech, each tree is realized in sound by means of specific features: these sound features in a tree-partition family must be different enough from other tree-families, in order no to be confusing, since they occur simultaneously on the same –spoken– text. Moreover, inside each tree-family each level must be realized through a particular and clear application (parameter values or patterns, as in intonation) of its characteristic feature, in order no to confuse levels. Let see these characteristics for our two main trees, Syntax and Metrics. Rhythm, that is, the way of delivering speech in time is the main feature of realizing metrics in sound. This feature is a highly specialized one since it involves: 1. Assigning relative durations –quantities– to each metric partition, so making duration patterns, and 2. Establishing periodicities with these patterns in order to mark and make their recurrence felt. The first operation depends of the type of metric: for quantitative metrics –Old Greek, Arabic, Persian– long syllables take 2 or 3 times the duration of the shorts, and feet tend to occur regularly. Lines occur also regularly, with of course a wider time period. For accentual metrics –nursery rhymes, ‘modern’ and very old (i.e., Saxon) poetry, ‘free’ verse– accentual feet –one main stressed syllable accompanied by 3, 2, 1 or none–tend to occur regularly. Lines also with wider periods when equi-stressed –equal number of feet– or without periodicity when not. Syllabic-accentual metric –usually called syllabic– use syllables as rhythmic units, which tend to be regular. Their number in a line is usually the same until the last stress. The verse line, in all these metrics is usually marked by pauses, which part the sounding chain into discontinuous units. Higher metric levels are realized with longer pauses, as stanzas and strophes, being the poem distinguished usually with a title –even with a quotation–, delivered with different cadence, so marking its parting nature and function. The syllable itself, the lowest level of all metrics expresses itself though its phonetic nature, which creates alternate segments of noise-pitched sound, closeness-openness, in brief, consonant-vowel opposition. Accent –melodic, tonic accent– plays also an important role in joining several phonetic syllables in one –sinaloepha, sinaeresis – or breaking one into several –dieresis, hiatus–. Moreover, the poet’s fancy can make arbitrary syllables where ‘there was no reason’ to do so. We presented an unified perspective of the syllable in Sánchez (1996). From the acoustic‑phonetic point of view, speech -‑including verse‑- can be considered as a variation in time of perceptive acoustic aspects known as traits: features that present a relative independence, since we can change one of them, leaving the others unaltered. These traits are: tone or pitch, intensity or loudness, timbre or colour. If these traits are kept constant for a while (i.e., a tenth of a second), and then at least one of them, say pitch, suffers a sudden, sharp[i] change (i.e., in a fiftieth of a second), the result will be a sound event or unit, (i.e., the time interval between the beginning and the sudden change, or between two other consecutive sudden changes) whose duration can be measured (see Fig.1). This duration, called quantity, constitutes an additional trait. Hence we can consider the temporal continuum of sound as a chain of phonic units, which correspond, approximately, to the allophones (i.e. sound realizations of phonemes) and will therefore present all four traits. The timbrical oppositions mainly –but other traits can be used as well– between adjacent allophones produce, in turn, units of a superior category: the syllables, typically emerging from a pair of allophones, the first being shorter, noisier and less voiced than the second: the CV pair (consonant‑vowel)[ii]. These syllables acquire, from their allophonic components, pitch, intensity and duration values, all these focused in the vowel, which becomes the syllabic nucleus. At this level, syllables present a mutual and collective organization, by being some of them marked whereas others remain unmarked, thus giving rise to metres and rhythms, especially in poetic speech. The concept of markedness is somewhat similar to which is called salient in functional grammar (Halliday 1988: 272), and will be discussed later in some detail. See also García Calvo (1979:301-317) and García Calvo (1990:316-386). Especially relevant is the problem of enjambment recitation, which has been a matter of disagreement between those who recommend avoiding any pause in run-on lines, and those who wish the contrary: a pause always....A compromise between both approaches, –called sounding pause-was proposed in Sánchez and Bergé (1999), where the three methods is procedure were tested with a threefold criterion, sense, rhythm and beauty, with good results for the mentioned compromise. 6. Syntactical and metrical notations. Alarcos Llorach, Emilio (1971). Fonología Española. Madrid: Gredos. Bolinger, Dwight (ed). (1972) Intonation. London: Penguin. Domínguez Caparrós, J. (1993) Métrica española. Teoría de la literatura y literatura comparada. Madrid: Editorial Sintesis. Crystal, David. (1975) The English tone of voice. London: Arnold. Downing, Angela and Locke, Philip. (1992) A University Course in English Grammar. London: Prentice Hall. Firbas, Jan. (1992). Functional sentence perspective in written and spoken communication.Cambridge: Cambridge University Press: 80. Garcia Aráez, J. (1997) Verso y Teatro. Guía Teórico-Práctico para el actor. Madrid: San Federico 13. García Calvo, A. (1979) Del Lenguaje. Madrid: Lucina. – (1990). Hablando de lo que habla. Madrid: Lucina. – (1983) De la Construcción (Del Lenguaje II). Madrid: Lucina. Halliday, M.A.K. 1988. An Introduction to Functional Grammar. London: Arnold. Kaisse, Ellen M. 1985. Connected Speech. The Interaction of Syntax and Phonology. Orlando, Fl: Academic Press. Kolmogorov,A.N. and Fomin, S.V. (1972) Elementos de la Teoría de Funciones y del Análisis Funcional. Moscu: Mir. Laver, John. 1994. Principles of Phonetics. Cambridge: Cambridge University Press. Liberman, Mark. (1975) The intonational system of English. Ph.D. Thesis. M.I.T. (distributed by Indiana Linguistic Club. Navarro Tomás, Tomás. (1974) Manual de Entonación Española. Madrid: Guadarrama. –. (1991) Métrica española. Madrid: Labor. Pierrehumbert, Janet. (1981) "Synthesizing intonation". JASA. 70(4). Oct.
Quilis, A. (1964) “Estructura del encabalgamiento en la métrica española.” Revista de Filología Española. Anejo LXXVII. Madrid: CSIC. Roelof de Pijper, Jan. (1983) Modelling British Intonation. Dordrecht: Foris / Cinnaminson. Sánchez, F.J (1995b) “Teoría preliminar de la sílaba” Lenguajes Naturales y Lenguajes Formales XI C. MartínVide (ed.) Barcelona: Promociones y Publicaciones Universitarias: 569-578. – (1996) “En busca de una interválica musical subyacente en la palabra” Lenguajes Naturales y Lenguajes Formales XII Martín Vide, C. (ed.) Barcelona: Promociones y Publicaciones Universitarias: 539-546. Sánchez, F. Javier and Becerra, Néstor. 1991. "Síntesis de habla por concatenación alofónica" Memoria Interna. Madrid: Lab. Trat. Palabra y Música, IEC-C.S.I.C. : 2-88. Sánchez, F. Javier. and Bergé, Heliane. (1993) "Hacia una implementación computacional de una Semántica Multicontextual". Leng. Naturales y Leng. Formales, IX. Barcelona: Promociones y Publicaciones Universitarias. – (1997) "Rhythmic and Phonetic Transcription of Two Recitated English Sonnets". Rev. Estudios Ingleses. Dep. Filolog.Inglesa. Fac.Fil.Letras, UCM Nº5: 91-114. – (1999) "Recitación del Encabalgamiento". Actas Cong. Asociación Española de Lingüística Aplicada 99 Alcalá de Henares: Aesla. Selkirk, E. (1984) Phonology and Syntax: The Relation between Sound and Structure. Cambridge, Mass. : MIT Press. – (1984) The Sonnets. (read by Pasco, R.) Argo 1283. Hayes, Middx: EMI Records. – (1988) The Complete Works. Wells, S. and Taylor, G. (eds.) Oxford: Clarendon. Theocaris, T. (1997) (ed.) “ Hamlet III,i.“ John Gielgud at the BBC. Radio collection recordings, BBC Ltd.
Vaissière, Jacqueline. (1974) "Fréquence Fondamentale des phrases déclaratives en français". Abst. 5émes Journ. d'Etudes du Groupe Comm. Parlée. Orsay: Groupe Communication Parlée. [ii] . Hence, the syllable is, using metrical terminology, a sort of timbric foot, in the sense that a syllable presents a timbric cluster with an opposition between two basic timbres: consonantal (noisy, unvoiced, transitory) versus vocalic (continuous, voiced, musical), with intermediate forms; this cluster is formally similar to the traditional metric foot, a syllabic cluster with the long/short opposition (Sánchez 1995b).